Putting in tomato cages has to be one of the most frustrating things I do in the garden. I don't know what makes it worse....the flimsiness of the wire legs or the rocks underneath the soil. Either way every year I feel like I'm going to loose my mind when it's time for this chore! Half the time they didn't get in deep enough and when the plants became too big, they start to knock the cages over. At that point I end up putting wooden stakes in to try to keep the plant from tipping over. What an ordeal! I mean...this should be fairly simple right? 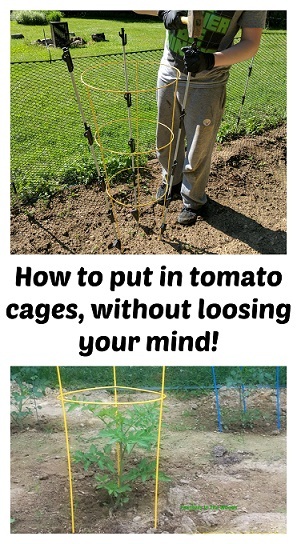 Place the cage over the tomato plant. Press the legs firmly into the soil several inches. That's it. Except if you press too hard, the legs bend. If you hit a rock, the legs bend. If you don't get all 3 in the same amount...the legs bend. Sheesh! This year I decided to try something different. I used a fence stake and a mallet to simplify the process. You'll want to water the area about an hour before you cage your tomatoes. You want the soil to be damp enough to stick together, but not so wet that it runs like mud. Place the tomato cage over the plant and pressed down gently to mark where each leg would go. Put a plastic fence stake on the outside of the cage leg. Pound the fence stake in about 6" deep with a mallet. Do the same thing for all 3 legs. Remove the fence stakes and shift the cage legs out a bit till they go into the stake holes. Fill the holes in with dirt and watered them to make the dirt mold around the legs. That's it! You have no idea how much easier this was! No bending at all. I did this for the old metal cages and the new plastic coated, metal tomato cages. It worked well for all of them. As you can see we got a few of those colorful new round metal tomato cages that have been in all the stores this year. Youngest son talked me into them. He has been helping an awful lot lately though, so when he asked if he could have some "minion colored" cages, I gave in. They cost twice as much as the regular ones, but I had an issue with some rusting on the old ones so I figured it won't hurt to try. They seem to be holding up a lot better though I don't know if it's the plastic coating or the thicker metal wire that they're made of. I know most people that use tomato cages don't like this metal type, but that's all I had access to at the time. I am looking for plans for building my own wooden cages to stake my tomatoes. Wish me luck on that! Oh these are a great invention/ I wonder if I can find such cages near me. And I am all for the Minion coloured ones too! We got these at Lowes. They had red and green also. Happy shopping!